Create a strong–yet beautiful–online presence for your business. Forefront is a fully responsive theme that helps you to create quickly a website for your business. The layout adjusts itself depending on the device you are using. This means your site will look good not only on desktop and laptop browsers, but also on devices with smaller screens, such as mobile phones and tablets. With our Jetpack plugin, you can easily create testimonials and display social links. You can purchase and activate Forefront for your site on WordPress.com or purchase and download Forefront for your self-hosted WordPress.org site. 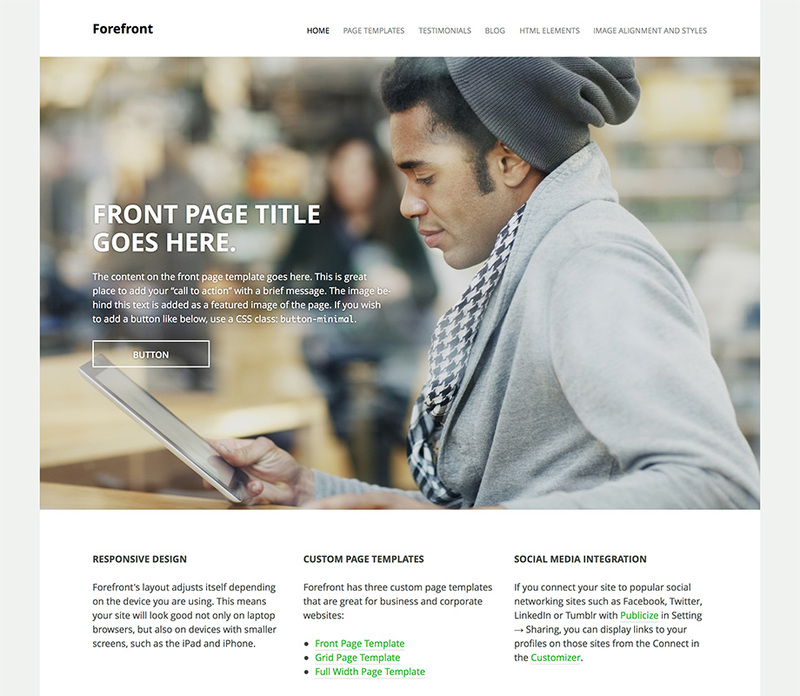 Forefront has three custom page templates that are great for business and corporate websites. Front Page Template: This template is perfect for the front page where you can introduce your business to the world. Rich, powerful, and flexible, the front page template includes three optional widget areas, a big leading image with a call-to-action, and two testimonials. Grid Page Template: The grid template is great for a portfolio page, a case study page, or a page to introduce your team members. Full Width Page Template: The full-width template gives you plenty of space to embed a map of your office or showreels. The layout adjusts itself depending on the device you are using. This means your site will look good not only on desktop and laptop browsers, but also on devices with smaller screens, such as mobile phones and tablets. Testimonials from happy customers and clients are important to include on your site to establish trust and encourage potential customers. With our Jetpack plugin, you can easily create testimonials. If you install Jetpack plugin, you can easily display links to your profiles on Facebook, Twitter, LinkedIn, Google Plus or Tumblr in your site’s footer. We take customer support seriously. Theme support and documentation is available for all customers. If your site is hosted on WordPress.com, post your questions to the forum. If you purchase Forefront on Creative Market, one-on-one support is included. I like the clarity of the Forefront theme. It’s sleek and elegant with some beautiful responsive features. My clients love it, and they were especially smitten with the grid template: It allows me to showcase my pages and introduce the different aspects of my work without overwhelming the viewers, giving them the freedom to browse around my website in any way they like.